One of the biggest challenges facing next-generation electrode implants – think cochlear implants that have revolutionized the approach to restoring hearing – is that there is often a “mechanical mismatch” between soft tissues and stiff implants. The resulting stress can cause inflammation and even outright rejection by one’s body, rendering even the most sophisticated implants useless. Now a multidisciplinary team headquartered in Switzerland that includes experts in materials science, electronics, neuroscience, medicine, and computer programming is moving toward clinical trials of what it calls e-Dura, short for “electronic dura mater,” which mimics both the shape and elasticity of dura mater, the protective membrane of both the brain and spinal cord. In a study published last week in Science, they reported that their soft, flexible implant, which is embedded with electrodes, interconnects, and chemotrodes that can handle millions of cycles of mechanical stress, chemical injections, and electrical stimulation pulses, is working so well in lab rats it’s allowing them to walk again even after paralyzing spinal cord injuries. The stretchy, electronic dura mater not only avoided triggering an immune response, which often results in inflammation, it also more closely mimicked the rats’ natural movements. Beyond better integrating with the flexible tissue itself, e-Dura is also capable of delivering electrical impulses and chemicals, and even monitoring electrical signals from the brain in real time. This allowed the researchers to see where the rats intended to go before they even moved. When Dr. Jamie Williams, a biomechanical and medical device expert, demonstrates the “viscoelasticity” of biological materials like the dura mater, which she is called to do both as an expert witness in court and a professor, she likes to bring silly putty, she told me. Williams added that there is currently litigation of an entire genre of medical products designed to address urinary incontinence and pelvic organ prolapse. Medical device companies have been implanting mesh material to address these issues, but they’re failing as a whole, and Williams said this is largely because the material properties are inadequately matched. Other attempts to rethink these kinds of implants also involve resolving this problem of mechanical mismatch. Just last year, one paralyzed man from Poland was able to recover some mobility and sensations in his legs after surgeons bridged his injury so that nerve cells, which were led on by a nose cell called an “olfactory ensheathing cell,” could regrow across the scar tissue. The e-Dura approach still requires implanting foreign, electronic material onto one’s spine or brain, so some amount of inflammation is likely to occur. 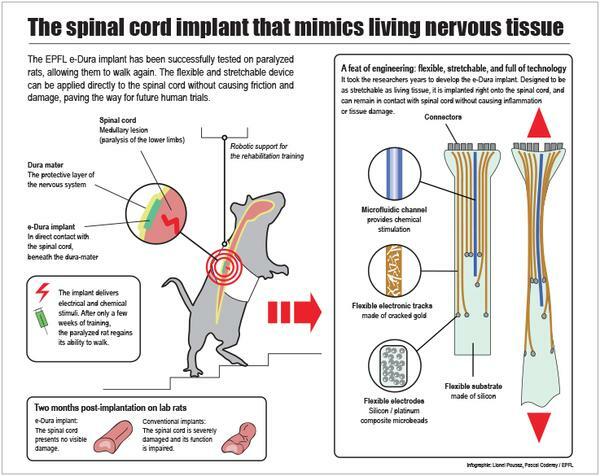 But as obvious as the solution sounds, it actually presents a novel approach to brain and spinal implants that could ultimately have implications for a wide range of patients, including those with spinal cord injuries, Parkinson’s, epilepsy, chronic pain, and Tourette Syndrome. This does, however, mean that even given successful clinical trials, which the Swiss team hopes to launch as early as June, we’re likely still years away from FDA approval in the US, Williams cautioned. We can easily decipher that this invention of Sony is targeting the huge aging population of Japan. They want to get a hold on to the market. If I was a kid, this is exactly what I’d want to study in college. I think this would be a fascinating and rewarding field to be in.